July 2009 issue of the British guitar magazine, Guitar Techniques. Each issue has a variety of lessons, interviews, tutorials in all styles and lots of song tabs. This is issue comes with a free CD of all the backing tracks and lessons. 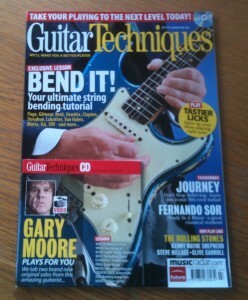 Featured in this issue are Journey, Gary Moore, Rolling Stones etc. and songs include Don’t Stop Believin’, Study in A minor by Fernando Sor and many other articles and features. The magazine is in fair condition, with some marking to the cover and wear to the corners (see photo).